Ivory Snow 2x Ultra Laundry Detergent (25 oz) is the one gentle care detergent for all your fine washables. It is made for whites, brights, darks, multicolors, delicates and all sensitive fabrics and is concentrated to give you the same gentle clean while allowing you to only use half as much. This liquid laundry detergent cleans without using harsh chemicals and rinses away thoroughly, leaving clothes virtually residue free to ensure a gentle, soft feeling against the skin. 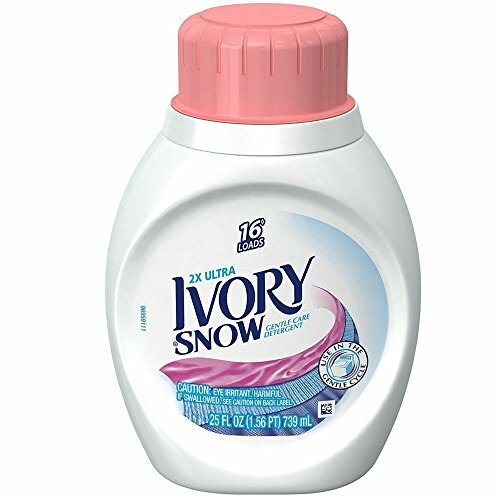 With its ability to be used on nearly any fabric for any member of the family, from lingerie to baby clothes, Ivory Snow Laundry Detergent is the perfect choice for your family's laundry. Ivory Snow cleans without using harsh chemicals and rinses away thoroughly, leaving clothes virtually residue free. And that ensures a gentle, soft feeling against skin. If you have any questions about this product by Ivory Snow, contact us by completing and submitting the form below. If you are looking for a specif part number, please include it with your message.